I love ordering personalized shirts for my girls, especially Sibling Shirts! Any time I need to order personalized shirts, there is one company that will get my business over and over again because they not only meet but always exceed my expectations and that company is Zoey’s Attic. The first time I ordered from Zoey's Attic I was pregnant with Sophia and badly wanted Sibling shirts, I browsed some on Etsy and came across this amazing design and just had to have it! I unfortunately never got pictures of the girls in them because right after Sophia was born, October we had a horrible snow storm and by the time I was able to get pictures, they both outgrew them! Fast forward to about 3 weeks ago. I asked Lilyana to pick out a new Sibling set, and of course she chose the Funky Owl set! I was able to customize just about everything, including the wording, style, and color! We went with Pink & Purple owls and Raglan pink Style. 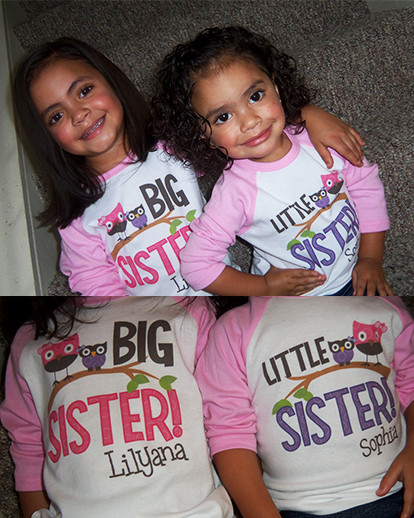 The shirts are adorable, Lilyana and Sophia absolutely loved them! They are now in the stage of not taking pictures together, so this was the best I got lol.. The wording on the shirts are digitally printed! This means the eco-friendly ink is printed directly on the shirts and not ironed or transferred on! Zoey's attic makes shirts, pillows, and bags for just about every occasion, don't believe me? Check it out for yourself! I highly recommend Erin, she's simply amazing at what she does! Zoey’s Attic Personalized Gifts is giving one of my lucky followers a $35 Gift Card to their store! DISCLAIMER: All products received are complimentary for testing purposes from Zoey’s Attic. All opinions stated are my own and are not influenced by any affiliates. What cute shirts to celebrate cute sisters! I would get my grand kids shirts!!! These are so cute!!!!! So cute. My daughter doesn't have a sibling, but those are definitely cute! I really want to get my hubby the Daddy Squared shirt since we just had our second! I'm always looking for personalized clothes and these are darling! Personalized shirts and statement shirts are really hot commodity now. I love getting personalized sibling shirts to announce a new baby! So much fun! Love this idea! They look so adorable! I really want the "This is my last one (I'm serious this time)" maternity shirt! I'd like to purchase big brother shirts for my boys. I would get the sibling of 3 custom set. Ive been looking high and low for matching shirts so the kids can have their pictures taken together. I really love the maternity shirts or the sibling shirts! I'd get sibling set tees for my best friend who is about to have her second baby. Love her stuff! Got my shirts in just 3 days!!! They are fabulous!! I just adore these shirts... especially the big sister to be raglan ones. love these shirts they are adorable! How cute! I love that picture, too! Personalized items make such great, meaningful gifts! I just checked out their site, and absolutely love what I am seeing! I am going to get my niece a couple of items I saw! I'd get some blankets! thanks for the fun contest! Oh I love those shirts. My kids have unique names and these would be perfect. I love those shirts they have on, so cute! :) Thanks for having this giveaway. I'd choose the big dude/little dude shirt as a Christmas gift for my guys! If I win I'm totally going to be looking for an adorable newborn "my first christmas" outfit for sweet baby #6 due next month <3. I just placed an order of big bro/big sis shirts from Zoey's Attic and can't want to get them! Big brother/Little brother sibling shirts!! I love the leg warmer and onesie sets and the toothfairy pillows. Even though my boys are no where near old enough.